Instead of the traditional, requisite Memorial Day cookout, we decided to take a day trip. After putting the American flag at the mail box, we drove down the interstate to the Pecos Pueblo National Historical Monument. We had not been there for several years, and so we thought it would be a great visit. The weather was beautiful as was the drive up from Santa Fe to Glorieta Pass where the road to the monument takes off. Because the pass is one of the main breaks in the Rocky Mountains in New Mexico between the eastern plains and the Rio Grande basin, it is filled with history. During the Civil War, the Confederates had organized the Confederate Arizona Territory which included southern parts of what are now Arizona and New Mexico (some things never change) with the ultimate goal of seizing the gold and silver mines of California and Colorado. Santa Fe had fallen to the Confederates, and things were looking bad for Union forces until the two sides met in Glorieta Pass where the Colorado infantry and the New Mexico militia turned back the Confederates whose supply train was ultimately destroyed, forcing them to give up their effort. Glorieta Pass is also where the Santa Fe Trail crossed from the prairies into the Santa Fe region. The trail followed earlier native American trails and was established in the late 1700s, but eventually became the main trade route from Missouri settlements in the United States with Mexico, of which Santa Fe was a part until the end of the Mexican War in 1848. But preceding all of that, the region was the center of trade between the peoples of the plains and the pueblos. Pecos Pueblo sat at the juncture and became a thriving trade center. At its peak, there were over 2,000 individuals living in a five-story dwelling. The Spanish explorers first visited the pueblo in 1640 and immediately set about to convert the population to Christianity. A huge church was built to hold all 2,000 residents at one time. During the Pueblo Revolt of 1680, the church was set on fire and destroyed, but in the re-conquest, another, less grandiose church was built. Over time the pueblo fell on hard times and the population diminished until the few remaining individuals relocated to Jemez Pueblo. The structures fell into ruins – a sight-seeing side trip for folks traveling on the Santa Fe Trail. Now, only ruins remain, but the site is an impressive and interesting glimpse of the local history. So much for my ramblings. Now it’s on to recipes. We decided to delay our traditional cookout and wound up having barbecued ribs, Susan’s famous brisket, Sarah’s herbed potato salad, coleslaw, and Southern buttermilk cornbread. 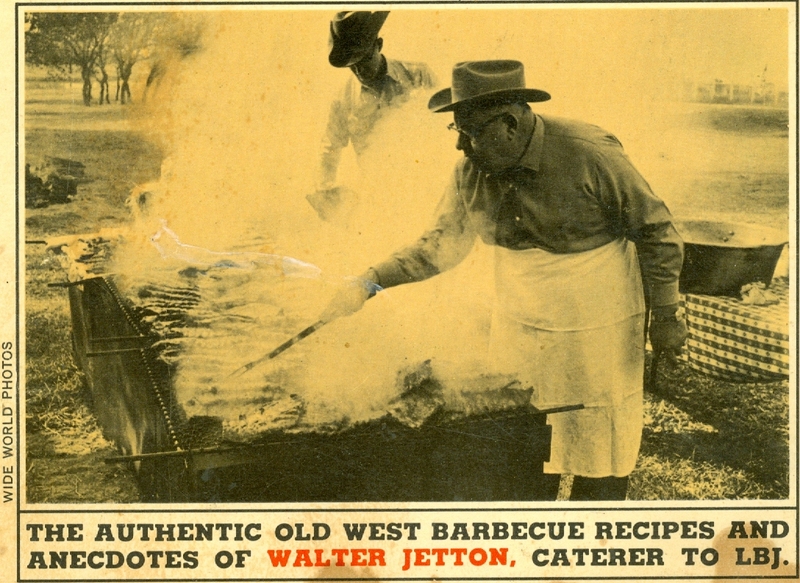 For the barbecue, I used recipes from a cook book that has been in our family for 50 years: Walter Jetton’s LBJ Barbecue Cook Book (Pocket Books, Inc., New York, 1965, $1.00) Walter Jetton billed himself as caterer to the LBJ Ranch. He was from Fort Worth, but spent a lot of time in Washington, D.C. introducing Hubert Humphrey and other politicians to authentic Texas barbecue. Here are my modest revisions of his recipes for dry rib rub and barbecue mop, two essential condiments for barbecue. With a small (new) dish mop, brush on barbecue meats frequently as you cook them. Refrigerate any that is left over when you have finished barbecuing. Store it in a tightly-lidded jar. It will last for a long time. Well, good luck on the game. The trays are very handy for this time of year. The day trip sounds perfect for Memorial day. The full spread, Susan’s famous brisket, Sarah’s herbed potato salad, the coleslaw and Southern buttermilk cornbread sound like such an amazing treat. What a way to live – travel and wonderful food with family. Thanks, Shanna. As you know, there are so many interesting places to visit near where we live. Thank you, Karen. There are lots of ex-Texans in Santa Fe. Once a Texan always a Texan?? ?